Indian capital city Delhi’s monkeys are huge, bulky, aggressive and their strength, too, is rising. Hearing this, one of my friends from GlobalPost, Mark Scheffler, was here to report on the monkey menace. A 3:45 minute video was the result. I made some quick translations therein, then and there, while this award-winning journalist moved with his camera, smiling all through the Delhi streets. Mark specializes in print, video and multimedia journalism, and his work and travels have taken him to over 35 countries. I really like Mark’s story telling ways… and hey, can you spot my office — PTI Building — too, which is also not free from monkeys. Monkeys Monkeys Everywhere. Why not … as Delhi expands, affecting the green areas in and around the capital, which for centuries have been the monkeys’ habitat. 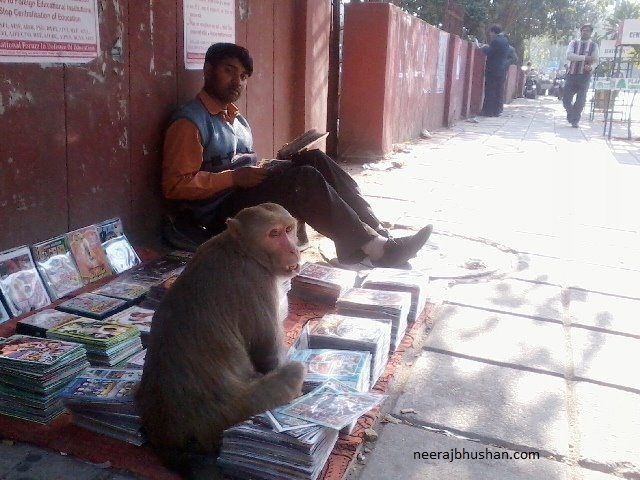 With their territory encroached on, many monkeys uproot to settle in the city centre – as seen in this photo (left) that I clicked on a winter morning some time back near a metro station 500 metres away from India’s Parliament. I agree. Urbanisation may be the cause. We may soon be the only mammals left on the planet. Yes. We have walked down actually in our march towards progress. Poor planning and total lack of leadership have pushed us to this extinct.